Several thousand Egyptians rallied in Cairo's Tahrir Square on Friday, protesting what they said were attempts by the Muslim Brotherhood to impose its ideas on society. Nearly 30 political parties and movements marched across the capital for the protest, dubbed "Egypt is no-one's private estate - Egypt for all Egyptians." Protesters held banners demanding better constitutional representation and "social justice." One common chant accused the Muslim Brotherhood's supreme leader of "selling" the revolution. Marchers flew the flags of the Constitution Party, the Egyptian Current, the Revolutionary Socialists and the April 6 Democratic Front. Other banners showed slain activist Mina Daniel, while dozens of party members wore t-shirts showing their affiliations. Revolutionary groups, liberal and leftist forces called the protest earlier this week, voicing their disapproval of a draft constitution presented by Egypt's Constituent Assembly, a 100-person body they claim fails to represent the country's cultural and political diversity. One of the largest marches came from the Old Cairo district of Saida Zeynab and was led by prominent activist Ahmed Harara. A second was launched from Mostafa Mahmoud Square in Mohandiseen, with well-known leftist Kamal Khalil and the founder of Egypt's first independent syndicate, Kamal Abu-Eita, at its head. Chants at the Mohandiseen march called for "a free, revolutionary constitution" written by all Egyptians, and vowed to start the country's revolution "all over again" for the sake of those killed. One of the most impassioned protests were by the Baheya Masr, a women's movement, and the Social Democratic Party, both of which decried what they said were attacks on the status of Egypt's women in the newly drafted constitution. "Children should play not get married," read one banner, referring to alleged serious debate within the charter-writing assembly as to whether the marriageable age for females should be lowered to 9 years old. Another banner voiced opposition to Article 36 in the draft constitution, which stipulates that gender equality be decided with reference to Islamic jurisprudence. Pictures of prominent Egyptian women, including 1930s women's education advocate Nabaweya Mousa, were also on display. "We are here to say Egypt is not [President Mohamed] Morsi's private estate and we will not have them rule us anymore," said Iman Diab, a 16 year old demonstrator. "Morsi is only recreating Mubarak's old regime." Other activists who took part said that they didn't believe attacking the Brotherhood was the main goal. "I'm happy we are all working together again, but we [political forces] should focus on our demands instead of what we are against," said Salma Said, a well-known activist. "We shouldn't repeat the same mistake as before, when we only focused on our rejection of Mubarak and we disregarded our differences as to what we stood for," she continued, adding that she had come to Tahrir to hold Morsi to account for his first 100 days and to protest the government's attack on labour strikes. Egypt has seen several high-profile strikes since Morsi won the presidency in late June, mostly by workers demanding better conditions and higher wages. Some of these protests were quashed with violent police crackdowns, to the chagrin of many activists who believe implementing fairer wages was a core demand of the early 2011 uprising. "They use religion to justify attacking farmers," shouted protesters, led by Haitham Mohamaden, a member of the Independent Federation of Trade Unions. There was low-level violence throughout the day, when revolutionary groups turned on members of the Conference Party, founded by former presidential candidate Amr Moussa, calling them "remnants" of the old regime. 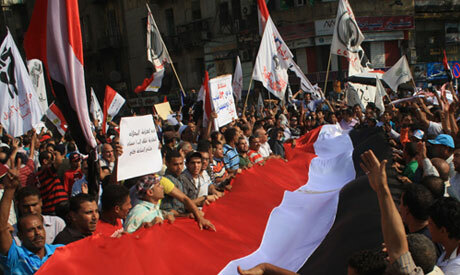 Other demonstrators on the square voiced anger at Brotherhood claims that their opposition to the Islamist group meant they were in favour of the old regime. It was possible to reject both the Mubarak regime and rule by the Brotherhood, they said, with some suggesting there was little difference between the two. "Morsi is Mubarak," went another common chant. Simultaneous protests by Brotherhood supporters and opponents in central Cairo last Friday descended into prolonged street-fights between the two sides in which over 100 were injured. The violence seemed to spur a larger showing of secular protesters on Tahrir this time around, including groups who were absent last Friday. "Those who beat Egyptians cannot rule Egypt," was another chant. Among the parties and movements taking part in Friday's protest were: the Popular Current, the Constitution Party, the Free Egyptians party, the Nile Party, the Egyptian Social Democratic Party, the Socialist Popular Alliance Party, the 6 April Youth Movement's Democratic Front, the Revolutionary Socialists, the National Association for Change, the Peaceful Change Front and the 'No to Military Trials' campaign. It's too late. You have to think before making uprising! Now you will get all "benefits" from uprising. It is to easy to go to streets and shout. And it is too difficult to be progressive, moderate, hardworking! The easist way is to be extremist or too religious! Verily Egypt for all the Egyptians and should be administered by the true essence and spirit of the historic revolution and aspiration without any external/internal provocation. It Is normal draft Constituent Assembly dominate by groups who won in election. but, it should be represented by many fractions of society. This is common ..... The loser parties should go to electoral ballot to change the leaders.This is common in democratic countries. No Mumby! It is not normal that this assembly is dominated by groups who won the election. A constitution has nothing to do with majorities or minorities or the political power momentum in a democracy. Otherwise you have to write a new constitution every time this political power momentum is changing. A constitution is above all this and it MUST (not 'should' as you wrote...) represent all parts of society to get a legitimacy for long term. A constitution written by a majority of a special political direction is worth nothing and contradicts the sense of a constitution. The constitution is (beside other items) about the shelter of the basic human rights of all citizens! Sorry to say, but your opinion is wrong or you must have a wrong idea what a constitution is. There is a misconception that Brotherhood members are good Muslims. they are not. The group represent a "Cult" with long record of violence, murders, and coorruption. they are detached from modern world and a reciepe for disaster. I challenge you to shutdown tourism, banks, modern learning istitution and abdicate women rights. Your venom is based on hatred of Islam and on lying. The Ikhwan are indeed good Muskims. This is the reason they were electede by the people. What the Brotherhood charter says? Islamic Shareha is applied in Egypt since the Mamules. What more they want? Probablyt to control Egypt wealth and wasted like Iran and other Islamic failed states. AO: Please publish their charter; I can not read AZrabic. The original message of Brotherhood was to serve and guide Muslims. SHeikh Elbana was even named the Morshed. Miltant members assasinated him and began a series of violence for lust of power. As we seen recently, theyt forged election, subressed opposition even within their ranks and moved toward Relgious Dictatorship. I am devout Muslim and do not beleive in their satanic behaviors. Allah AKber. Egypt is for all Egyptians.Egypt is and should stay as a secular state.Egypt is a Mediterranean and not an Arab country.